If there is one thing you know about Australians, they are very competitive. This means that they love sport and like to go all in when they can. The thing is, they tend to downplay sports that they are not very good at, which is why soccer isn’t really discussed in Australia too much. The game is one of the biggest things in the entire world, but because Australia are not very good at it, they overlook it for their own version of football. This means that there is a direct similarity between Australia and America. However, it seems as though Australia is coming around to the idea that they are good at basketball and there are plenty of basketball experts in the country making positive noises about coming home from Spain with a medal. Australian sporting stars don’t lack confidence, so it is understandable that they would be making this sort of noise but given that the Australian team has a group of players well over 6 foot, they may have the height and strength to cause a commotion in Spain. The talk down under is honest enough to admit that Team USA and Spain should grab Gold and Silver, as basketball betting sites agree with their FIBA World Cup betting odds, but there is a feeling that the Bronze medal is up for grabs. Australia may be lacking Patty Mills and Andrew Bogut this summer, but the squad that has travelled has a youthful energy and excitement about it. Over the course of the tournament, this could be the energy and vitality that makes all the difference when it comes to achieving success. One of the reasons that many people in Australia believe that they are due to have some success is found in the fact that the number of Aussie players in the NBA is growing all the time. When you play in the best league against the best players, it is only natural that you will develop new skills and grow in stature and confidence. This has to be something that will give the Australian team a strong platform for the 2014 World Cup, which could be the difference that sees the team grabbing a medal this summer. While the absence of Mills and Bogut means that the Australian team is lacking some of that NBA experience, there is Aron Baynes to provide advice and guidance to players. 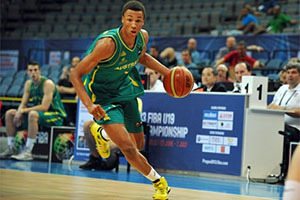 There is also the fact that Dante Exum has been one of the most talked about basketball players in America this summer. Exum was the 5th pick in the Draft and there are great expectations on him to perform well for the Utah Jazz in the upcoming season, and he will be joined at the Jazz by Brock Motum. Motum was signed by the Jazz after a great series of performances in Las Vegas at the Summer League. Australia believes that they are unearthing top quality basketball players with players like Ben Simmons and Thon Maker being tipped to make the NBA drafts in the coming years. Add in the fact that Cameron Bairstow has been snapped up by the Bulls and Matthew Dellavedova is going to be in the NBA as well this season and you have a squad of players who are talented and have something to prove. Something this psychological edge is what gives a team the impetus to win during these summer events. The fact that there are currently 7 Australian players in and around the NBA, with more expected to follow in the next year or two, suggests that Australia is doing something right with respect to producing basketball players. This means that the boasts of a medal finish at the FIBA World Cup may not be too outlandish.